The Society of Certified Senior Advisors (SCSA) releases its latest issue of the CSA Journal as an educational tool for professionals seeking information on topics relevant to their senior focused businesses. The e-version of the CSA Journal is available online at CSA Journal 57 for free to seniors, families and all professionals seeking new and relevant content on the health, social, financial, legal, arts, humanities and spirituality issues of aging. 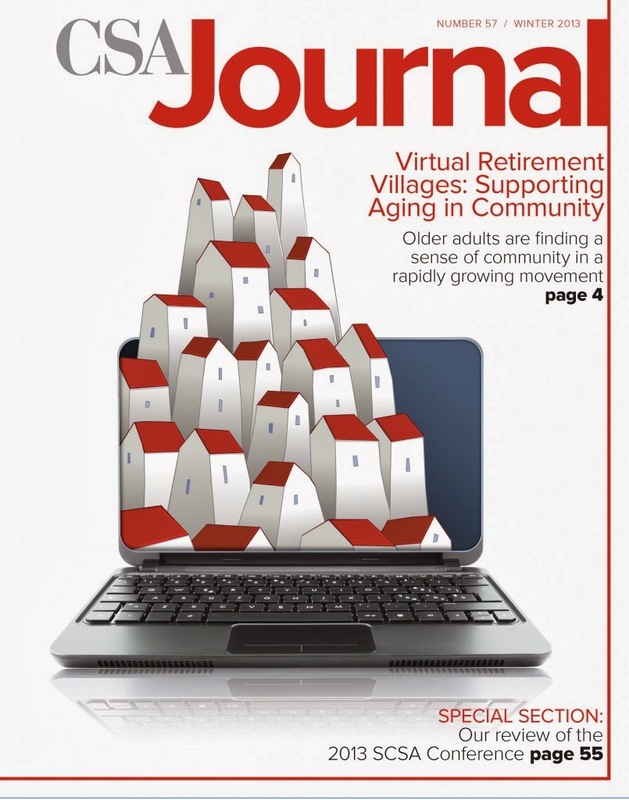 CSA Journal 57 features peer reviewed articles on topics such as Virtual Retirement Villages: Supporting Aging in Community, Hidden Assets: Managing Your Social Security, Networking: Business Benefits, Partnerships, and Best Practices and valuable Senior Client Handouts. Director of Strategy for Aging in Community for NCB Capital Impact and the Village to Village Network, LLC Candace Baldwin, M.S., EDFP describes the rapidly growing trend of the Village movement for older adults in her article in CSA Journal 57, Virtual Retirement Villages: Supporting Aging in Community. In this article, Baldwin explains how older adults searching for meaningful lifestyles as they retire are finding a sense of community and belonging in the rapidly growing Village movement. Social Security expert James A. Hurt, Jr., CLU, ChFC, CSA provides an informational article on the importance of understanding Social Security and knowing how to make the most of retirement benefits in his article Hidden Assets: Managing Your Social Security. Hurt explains the significance of carefully maximizing assets for people contemplating retirement, and provides information on the common failures for taking advantage of spousal benefits. Owner and CEO of SAGE WAVE Consulting, LLC, Erika T. Walker, MBA, MSeD, CSA shares her experience and expertise on business networking through her article Networking: Business Benefits, Partnerships, and Best Practices in CSA Journal 57. Walker explains that the importance and power of networking cannot be overstated. Organizations, businesses, and individuals must continually develop new connections and relationships to succeed. CSA Journal 57 is comprised of twelve informational articles written specifically for the benefit of professionals working with the aging population. All issues of the CSA Journal feature a practical case study, senior client handout and opportunity to earn CSA continuing education credit through the Case in Point section. For information regarding subscription to the CSA Journal, article proposals or to purchase ad space please go to www.csa.us/freeresources/csa-journal.